MINNEAPOLIS (AP) Even though the Timberwolves were the ones playing the second half of a back-to-back, the Pelicans were the flatter team. Karl-Anthony Towns is making a lot of teams look that way right now. 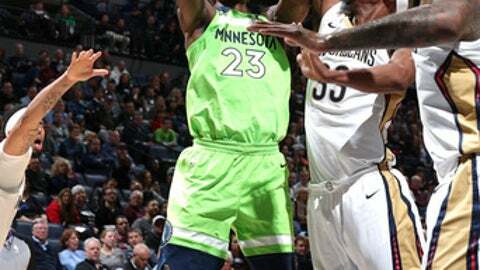 Towns and Jimmy Butler each scored 21 points, Andrew Wiggins added 20 and Minnesota cruised past New Orleans 116-98 on Saturday night. It took three tries, but Towns finally was able to spend more time on the floor than the bench against the Pelicans. In the teams’ first two games against each other, Minnesota’s young and emotional big man got into foul trouble against New Orleans’ physical frontcourt. ”It was good to be out there and try to help my teammates win instead of the last two times being on the bench,” he said. Towns went 7 for 11 and grabbed 16 rebounds for another strong effort after Friday’s 25-point, 23-rebound show in Boston. ”It was nice to see him play a game against New Orleans,” Timberwolves coach Tom Thibodeau deadpanned, noting that Towns kept his head despite some elbows and shoves from the likes of DeMarcus Cousins and Anthony Davis in the lane. And unlike Friday night against the Celtics, the rest of the Timberwolves also shot well. Taj Gibson had 15 points and Gorgui Dieng added 14 off the bench as the Timberwolves shot 48.9 percent from the floor and led by as many as 34. The win snapped Minnesota’s two-game losing streak ahead of a tough matchup next week against Cleveland. ”We understand we needed to get this one tonight,” Gibson said. Cousins led the Pelicans with 23 points and Davis added 16. But the Timberwolves held Jrue Holiday, who averaged 21 points per game in December, to single digits for most of the game. Holiday finished with 13 points on 6-for-13 shooting before fouling out with 3:45 to play. New Orleans turned the ball over 16 times – leading to 17 Timberwolves points – and was outrebounded 47-38. Pelicans: New Orleans shot 36.4 percent (8 for 22) in the third quarter and was 6 for 29 from 3-point range for the game. It was the first time the Pelicans failed to score 100 points since Nov. 25 against Golden State (17 games). … Cousins recorded his 29th double-double of the season. … The Pelicans fell to 2-13 when being outrebounded this season. Dieng had another strong performance against New Orleans after scoring 12 and 19 points in the previous two games. He shot 6 for 9, including 2 for 2 from 3-point range. The Timberwolves have held their last five opponents to fewer than 100 points. The last time that happened was a six-game streak from Nov. 5-12, 2012. Pelicans: Host Detroit on Monday night. Timberwolves: Host Cleveland on Monday night.